The private university students who were demonstrating on Tuesday called for boycotting classes in all the educational institutions across the country on Wednesday to press for their eight-point demand, including maximum punishment of the bus driver responsible for the death of one of their fellows in a road accident in the capital. 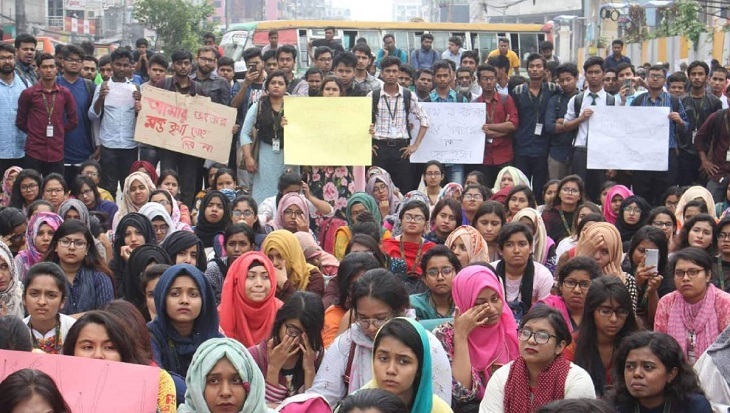 They said they will take position in front of Bashundhara Gate at Pragati Sarani on Wednesday morning to press for the demands and urged the students of all the educational students to take position in front of their respective institutions to express solidarity with the demands. Maisha Noor, a student of Bangladesh University of Professionals (BUP), announced the fresh programme while talking to reporters after withdrawing their road blockade in the afternoon over the death of their fellow Abrar Ahmed Chowdhury in the road crash. “Our movement will continue from Wednesday morning. We urge the students of all educational institutions to boycott their classes on Wednesday and express their solidarity with us taking position in front of their respective institutions,” she said. Abrar, son of Brig General (retd) Arif Ahmed Chowdhury of Bashundhara area and a honours 1st year student of International Relations Department of the university, died as a ‘Suprovat Paribahan’ bus ran him over in front of the Bashundhara Gate around 7:15am, said Jahangir, sub-inspector of Gulshan Police Station. Angered by the accident, students from North South University, Independent University of Bangladesh, American International University of Bangladesh and others took to the street and blocked the road in front of Jamuna Future Park, halting the traffic movement from Kuril Bishwaroad to Bhatara. Miasha said their movement is the continuation of last year’s road safety movement and it will continue until their demands are met. She also sought their security from law enforcers during the movement saying they do not want to see any bloodshed like that during the road safety movement of last year. Their other demands include checking of necessary papers, including driving licences on regular basis, making transport sector free from political influence, construction of footbridges and speed-breakers on all risky roads and stopping plying of unfit vehicles. Mentioning that their movement is not any political one, the BUP student said they will not allow any political party’s participation in it, urging the students to take part in the movement with their identity cards. Meanwhile, newly-elected Vice-president of Dhaka University Central Students' Union (Ducsu) Nurul Haq Nur expressed his solidarity with the students in the afternoon. He went to the spot after 4pm and expressed his solidarity with them. The road blockade created huge traffic gridlock in the adjacent areas. The students were chanting slogans demanding capital punishment of the bus driver who was arrested soon after the accident. Dhaka North City Corporation (DNCC) Mayor Atiqul Islam went to the area and talked to the protesting students. While talking to the mayor, the students demanded capital punishment of the driver and building of a footbridge in the area. Aitqul assured the students of fulfilling their demands. However, the agitating students set the killer bus on fire around 12:30 pm which was doused by local people.